(left-right) Mark Geschke, Nora Houser and Keith Baker spend their free time volunteering in different ways at the hospital. It’s for the kids. 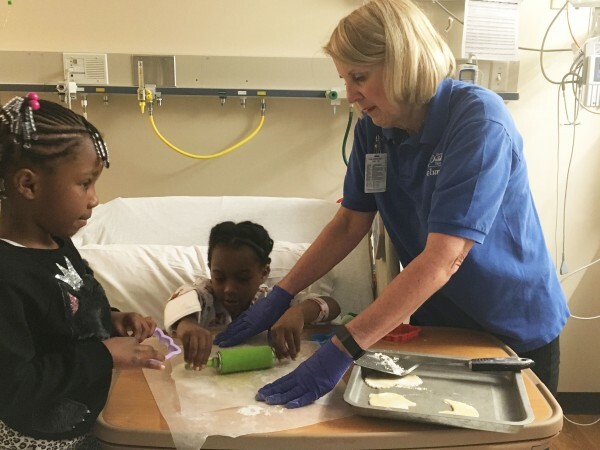 It’s a simple, but meaningful sentiment that is echoed throughout Akron Children’s Hospital’s volunteer department, and it’s a sentiment that unites Keith Baker, Mark Geschke and Nora Houser despite their different volunteer roles. Keith Baker started his volunteer experience at Akron Children’s about 13 years ago. On Wednesdays, he helps at the Locust information desk, his favorite part of which is helping discharge patients. For people who want to help kids, Baker says Akron Children’s is the place to volunteer. 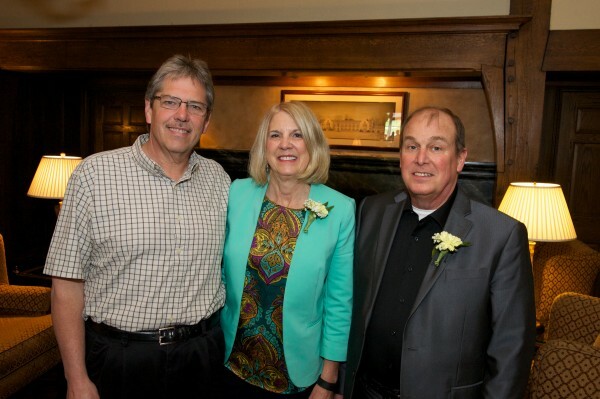 Mark Geschke began volunteering at Akron Children’s 2 years ago, shortly after his company, One Hour Heating & Air Conditioning, became a Children’s Miracle Network Hospitals partner. In addition to his company’s relationship with the hospital, Geschke has personal reasons for volunteering at Akron Children’s. Seventeen years ago, Geschke’s granddaughter, Megan, spent 5 months in the neonatal intensive care unit (NICU) at a Cleveland hospital before she passed away. “It’s my driving force,” he says. Now Geschke spends his day off each week volunteering at the Locust information desk. From running errands to and from various hospital departments to helping discharge patients, Geschke says he’s amazed at how much work and dedication go into the hospital. “If the volunteers weren’t doing these things, who would be? Who would have the time?” Geschke says. Outside of his weekly volunteer duties, Geschke says he’s most enjoyed the opportunity to be part of Santa and Mrs. Claus’ visit to the hospital on Christmas Eve. Mark Geschke takes a break from running errands at the hospital to take a photo with fellow volunteer Mary Church, who Mark says is one of his idols. 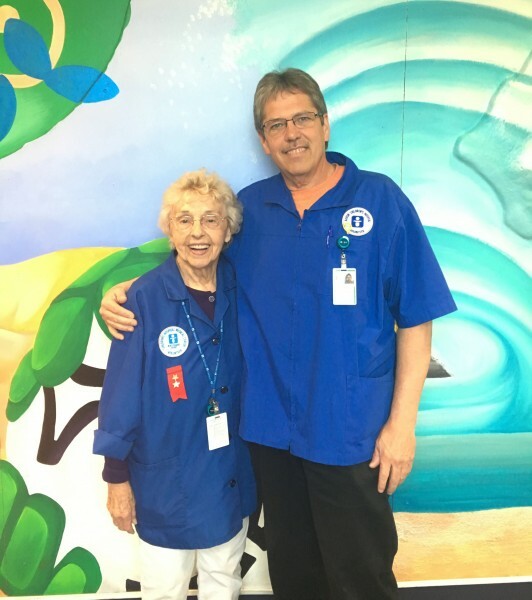 Nora Houser’s volunteer experience at Akron Children’s began about 8 years ago after she retired. She had previously worked as a home economics teacher and had also volunteered for 15 years at a camp for children with cancer. After the camp ended, a fellow volunteer told Houser about the volunteer opportunities available at Akron Children’s. She began volunteering with the Craft Cart, but when the Cookie Cart was created, Houser jumped at the opportunity to be involved. Now every Monday she visits patient floors wheeling the famous Cookie Cart, asking patients if they’d like to bake and decorate cookies with her. In addition to brightening kids’ days with the Cookie Cart, she also makes blankets with the parents for their NICU babies and embroiders each baby’s name on them. Nora Houser helps a patient and her cousin roll out cookie dough during a Cookie Cart visit. If you’re interested in becoming a volunteer at Akron Children’s, visit akronchildrens.org/volunteer for more information.